European roulette is a classic casino game that’s easy to learn. It is definitely one of the least challenging and most exciting games of chance, and the game has a rich history going all the way back to the 17th century. The game has been played by European kings and queens for hundreds of years, and there are several reasons for the popularity of the game. Anyone can learn how to play European roulette, and the game has a large selection of bets, making it perfect for both players who want to play with high risk and win large payouts, and for players who would like to play with lower risk and get slightly lower payouts. The greatest difference between roulette games and other casino table games is that roulette requires special chips that differ from normal casino chips in that they have no denominational value. Actually, chips like these are not chips, since chips with no denominational value should really be called checkers pieces. Roulette chips have different colors, and each player receives chips in a certain color, in order for the croupier to be able to distinguish the different bets. The value of the colored chips are established by taking the total amount of buy-in by the players and dividing it by the total amount of chips received by the player. First of all, it’s important to point out that roulette strategy and a roulette system is not the same thing. Many people claim to have come up with the perfect roulette system to guarantee winnings. Be wary of such promises and remember that during the several hundreds of years, roulette has been played, no one has been able to invent a system that guarantees a win every single time. Over the years, many roulette players have tried to develop the best roulette strategy in order to guarantee as many winnings as possible. Since roulette is a game based on chance, many players follow a certain strategic pattern in their game, so they don’t have to rely on luck. The first step in using a good roulette strategy is always to choose European roulette as opposed to American roulette. The reason for this is the advantage to the house in single number bets in American roulette is at 5.26%, whereas the advantage to the house in European roulette with single number bets is nearly half of that in American roulette, meaning about 2.70%. The reason for the large difference in the advantage to the house between these two types of roulette is the fact that American roulette is played with a single zero as well as a double zero, increasing the advantage to the house, since one number chosen from the payout is offered to win on a single number. Outside bets have lower payouts, but offers greater chances to win, making it a good strategy to focus on them, especially for players who have just begun to play roulette. For those players, who are interested in slightly higher risk with higher reward, we would recommend betting on small groups of numbers. These bets are inside bets, done on adjacent numbers. You can make a split bet on two numbers with a payout of 17-1 or a line bet of three numbers in a row with a payout of 11-to-1. In addition, you could do a corner bet of four numbers with a payout of 8-to-1 and a 6-line bet of six numbers with a payout of 5-to-1. One of the biggest errors made by beginners is placing too many bets all at the same time, or placing many different kinds of bets with exactly the same winning potential as placing fewer bets for less money. For example: Imagine you are betting $2 worth of chips on each number of the 18 low numbers and $4 worth of chips on each of the 18 high numbers, meaning you bet a total amount of $108. If the ball lands on one of the low numbers, you win $2 x 35 = $70. If the ball lands on a high number, you win $4 x 35 = $140, and if the ball lands on a zero, you lose all $108, you bet. Now, imagine that you had made a single bet of $70 on the 18 low numbers (an outside low bet), offering a 1-to-1 payout. The ball landed on one of the low numbers. You won $140. If the ball had landed on one of the high numbers, you would have lost your original bet of $70. As you can tell, several different bets for a total amount of $108 have the same odds as placing a single even-money bet of $70. Then why risk the extra $38, when you don’t have to? 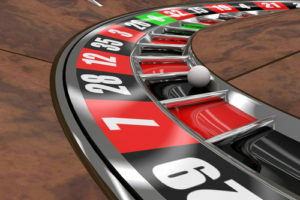 Therefore, a very good and easy roulette trick, is to simply place fewer bets!